Windows midget. The display of the HP Stream 7 might only measures 7 inches, but the tablet still sports full-fledged Windows 8.1 with Bing. How useful is Windows considering the smallish display? We'll try to answer this and many other questions in the following review. 7-inch tablets with Windows 8.1 are a rare breed indeed and until now, we haven't had the chance to review one. HP's announcement of the Stream 7 - a 7-inch tablet with an Intel Atom SoC and Windows 8.1 with Bing - therefore really piqued our curiosity. 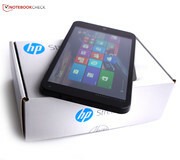 All of HP's devices which carry either "Slate" or "Tablet" in their name ship with an Android OS, while the newer "HP Stream" series caters to those who prefer a tablet with Windows OS. Other manufactures created new names for their Windows offerings as well - case in point is Samsung with their "Ativ" products. So far, the tablets released in the HP Stream series are rather inexpensive, and the HP Stream 7 sells for just 129 Euro (~$ 150). 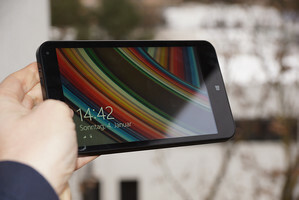 Direct competitors of the HP Stream 7 are the Dell Venue 8 Pro, Point of View Mobii WinTab 800W, Asus VivoTab Note 8, Acer Iconia W4 or the Lenovo Miix 2 8. 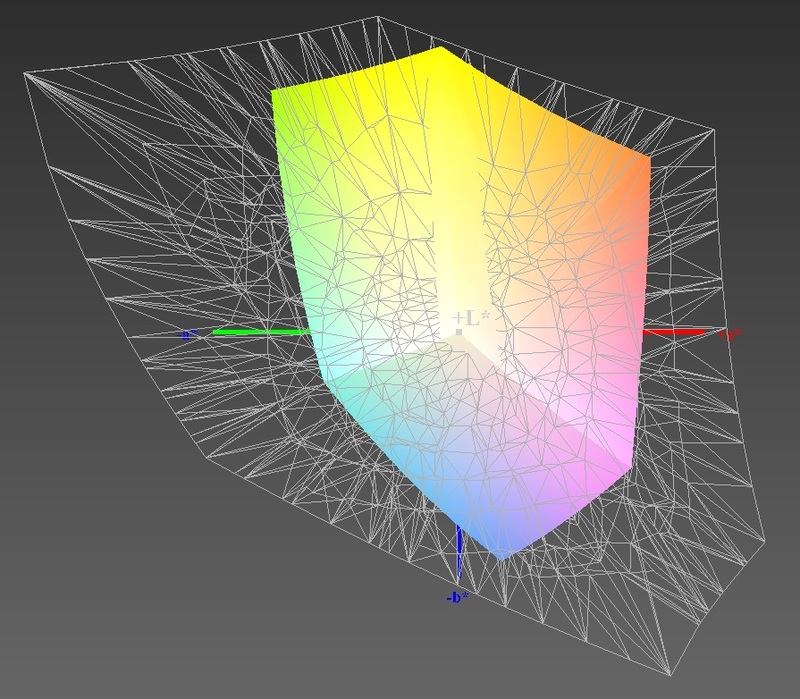 All these models have a screen which is larger by one inch, however. The chassis is a no-frills design which is susceptible to pressure. Of course, it's hard to deny the appeal of a high-end chassis made from metal, which is not only sturdy, but also feels good to the touch. Given the price of only 129 Euro (~$ 150), it is clear that certain concessions had to be made: the review tablet features a rather simple plastic design, with a haptic experience that matches the low price. The Stream 7 doesn't handle it well when pressure is applied to the front or the back and significant display color changes are the result. The case doesn't protest with creaking sounds when twisted, however and the various sections fit together well, so gaps are a non-issue. 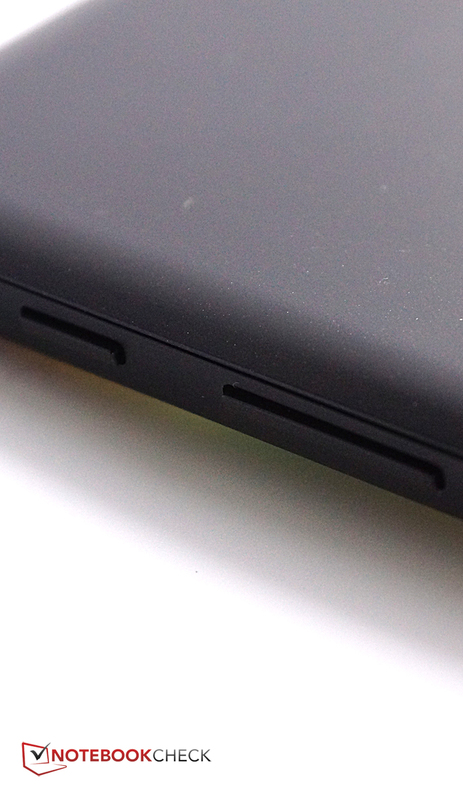 The back is slightly rough to the touch, which makes holding the tablet securely much easier. Although the back of the tablet can be removed, only the micro-SD card slot is accessible. The battery is visible, but can't be swapped out according to the attached label. Overall, the case design is solid, but features - in line with the price point - no noteworthy highlights. 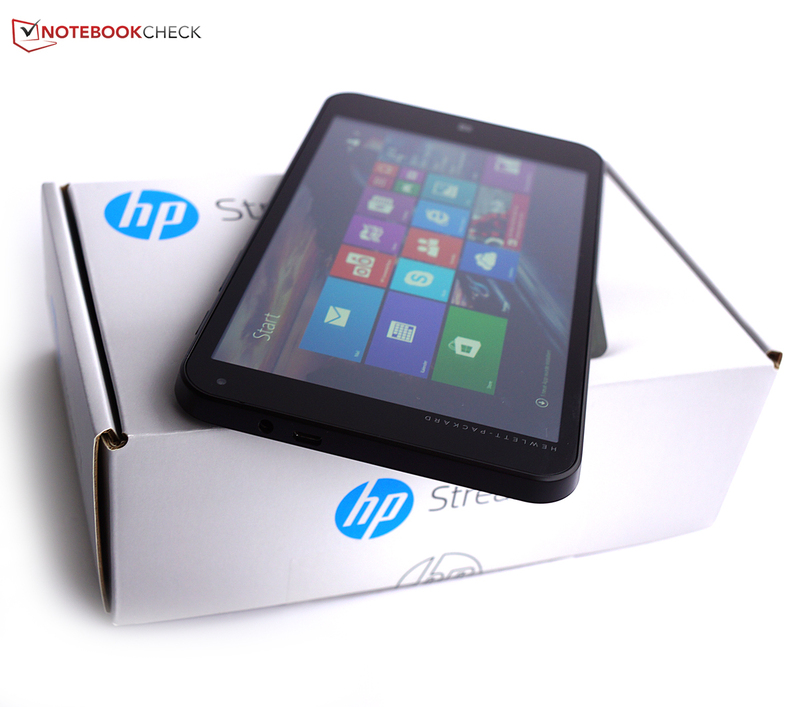 Given its price, the HP Stream 7 comes adequately equipped with 1 GB of RAM and 32 GB of flash storage. Comparable devices with more storage are also more expensive. 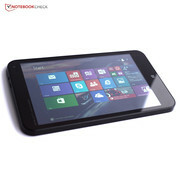 The Intel Atom Z3735G SoC is often the processor of choice in this price bracket - examples are the Dell Venue 8 Pro and the Point of View Mobii WinTab 800W. Other standout features are of the negative variety: the battery offers low capacity because of the smallish case and the camera quality is also rather weak, as we shall see a little later. Windows 8.1 with Bing is Microsoft's answer to low-priced Android tablets and Chromebooks. The manufacturer doesn't get charged for this particular Windows license, but in turn can't change the default search engine (Bing) in Internet Explorer. We are familiar with this practice, as other manufactures used to have a deal with Google, which was preinstalled as the default search engine. There are no drawbacks for the user, however, since additional browsers can be installed if so desired..
One of the advantages of Windows 8.1 is that the familiar desktop-functionality is extended to the tablet, including desktop and system settings. The tile interface is also an intuitive way to interact with the OS on a touchscreen device. The Desktop on the tablet is of course less user-friendly, since both icons and text are very small on the 7-inch screen, although we still were able to operate the device with reasonable accuracy. The data transfer to a Windows PC is a hassle in our opinion. After hooking up an Android tablet to a Windows PC, it's possible to transfer data via Explorer quickly and easily. A Windows tablet on the other hand requires either a connection to a wireless router or a Bluetooth connection to do the same. Both of these ways are more labor-intensive, less stable most of the time and slower as well. The easiest way to transfer data is using some form of the Cloud, although that usually requires uploading the data first before it can be downloaded to the tablet, which effectively doubles the time required. We like the fact that the Bing integration does not degrade overall usability and that Windows 8.1 runs smoothly despite the rather slow Intel Atom SoC. The Android OS does have its advantages, as we find it to be more comfortable and more intuitive when it comes to touch control. Windows 8.1 on a tablet offers an interface that most users are familiar with already and allows access to the system features just like on a desktop PC. It's up to the user to decide if Windows 8.1 is indeed useful on a device with such a small screen. The spec sheet hints at the fact that the cameras are far from impressive, as the resolution of 2 MP out back and 0.3 MP in the front is simply too low for decent pictures. Maybe HP should have done away with the low-resolution camera altogether and transferred the 2 MP camera to the front: in that case, at least the video conferencing quality would be decent. Users who just want to take snapshots for various social media accounts and don't expect much in the first place are likely going to be satisfied with the rear-facing camera. 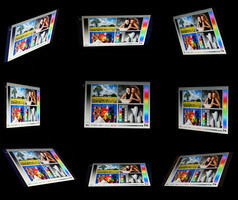 Extras like a LED flash or picture stabilization are not on board, however. The colors are decent, although the amount of captured details is lacking: when zooming into a photo, it starts looking like a watercolor painting and dark areas look rather dull. The front-facing camera produces an undefined pixel mishmash and is thus more or less unusable. The virtual keyboard is arranged neatly and the keys are large enough even when using the tablet in portrait mode. The keyboard can be detached and used in a floating manner, so it can be positioned freely to avoid covering up important elements. In landscape mode, typing with both hands is possible, although the layout is a bit cramped. The keys react promptly to inputs, even when typing at a good clip. 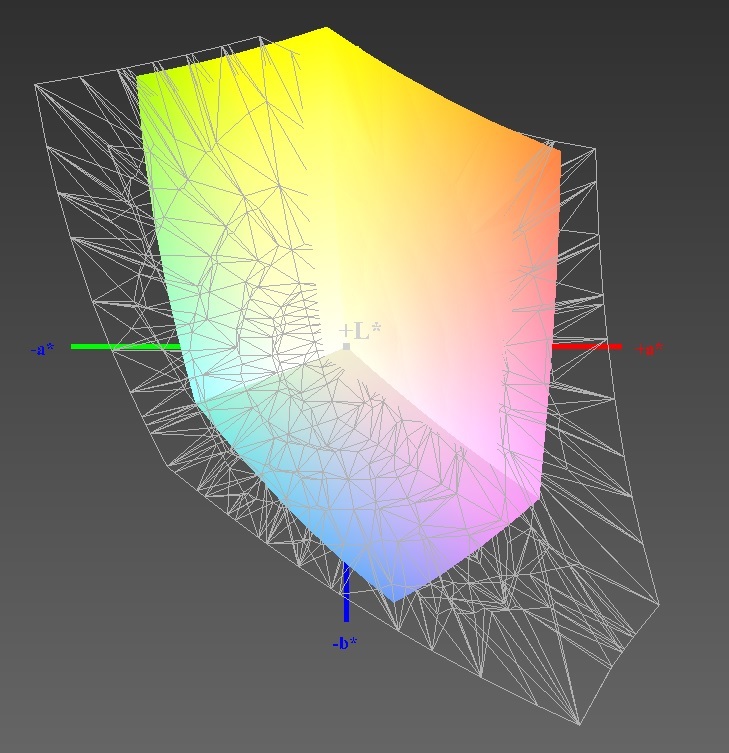 The touchscreen is very precise even in the corners and drag-and-drop is accomplished easily. Multitouch gestures like zooming or scrolling are recognized reliably as well. Additional control elements are the standby button and the volume control rocker on the right side of the tablet, which also react precisely to user inputs. The touch-sensitive Windows button on the bottom of the screen takes the user back to the start menu. Just like the larger 8-inch competition, the display features a comparable resolution of 1280 x 800 pixels. The brightness is clearly above average: we measured 411.2 cd/m², which means that the HP Stream 7 can be almost twice as bright as other tablets in our comparison. The brightness distribution of 78 % is a little uneven, which can be seen with the naked eye when looking at larger white and black areas. The panel is also fairly grainy, which results in brighter and darker spots; frontlighting reveals the contact wires integrated into the touchscreen. Although the display brightness is high, the black value is high as well at 0.6 cd/m², which in turn leads to black being displayed as a dark gray. Combined with the uneven brightness distribution, larger areas don't appear very homogeneous. 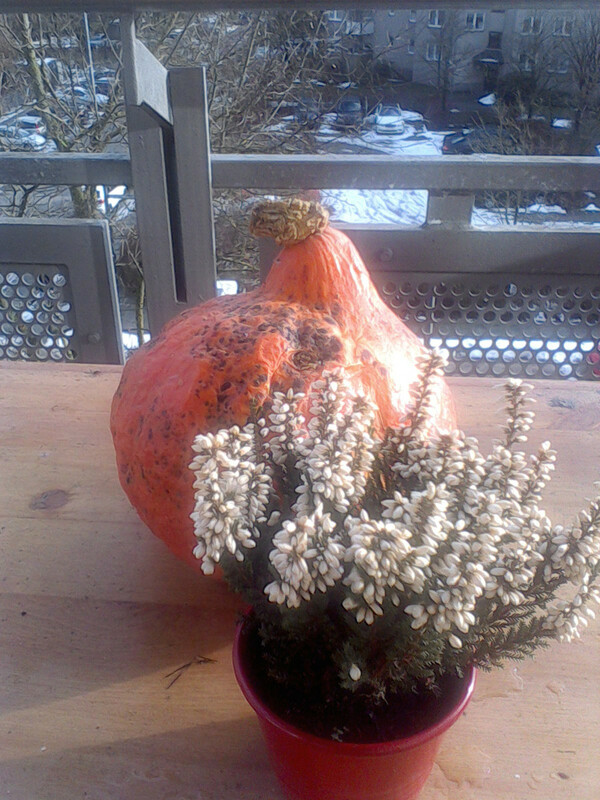 The resulting contrast ratio is 768:1, which is decent for the class. 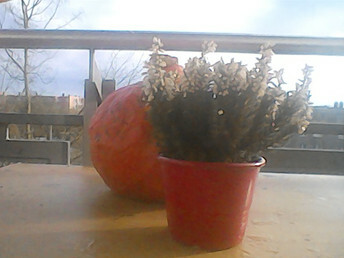 Colors are not particularly vivid, however. For a more detailed evaluation of the color reproduction we use a spectrophotometer and the software CalMan. A closer look at the graylevels revealed a distinct greenish cast compared to the reference color space sRGB with lighter grays affected the most. Among the colors, blues and light brown are affected the most, although pretty much all colors suffer from a greenish cast. The average deviation of the graylevels and colors compared to reference is higher for the Stream 7 than any other tablet in our comparison. The touchscreen is extremely sensitive to fingerprints. 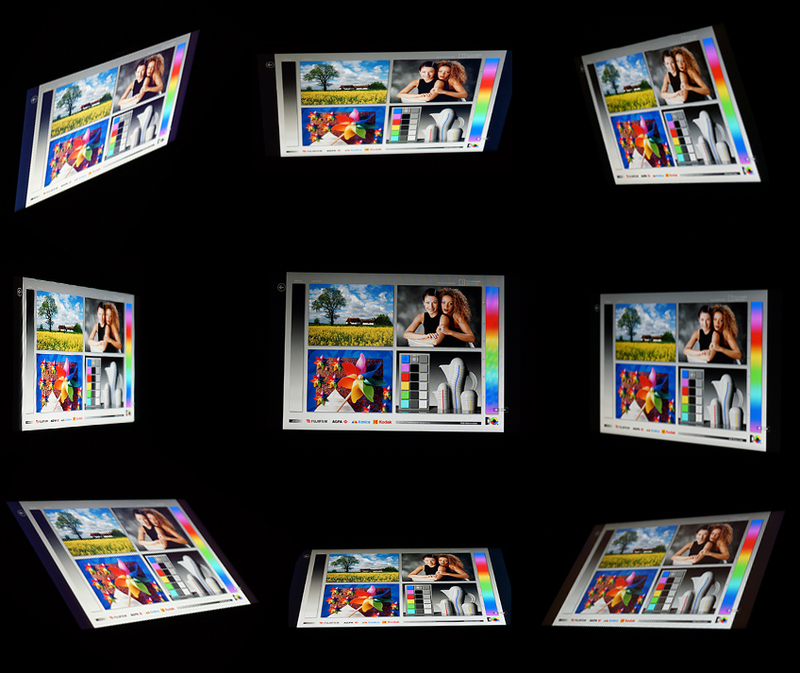 In combination with the glossy display surface and the visible contact wires, the display content appears drowned out in bright environments. The high screen brightness does help here, but eye strain is still high. Compared to other inexpensive tablets, the HP Stream 7 does fare better outdoors because of its bright display, but useability is not ideal. As far as the viewing angle stability is concerned, we find no reasons for complaints, as the IPS display remains stable with no color shifts or loss of contrast regardless of the angle. The HP Stream 7 comes with an SoC from Intel. The Atom Z3735G is a quad-core processor with a nominal speed of 1.33 GHz. 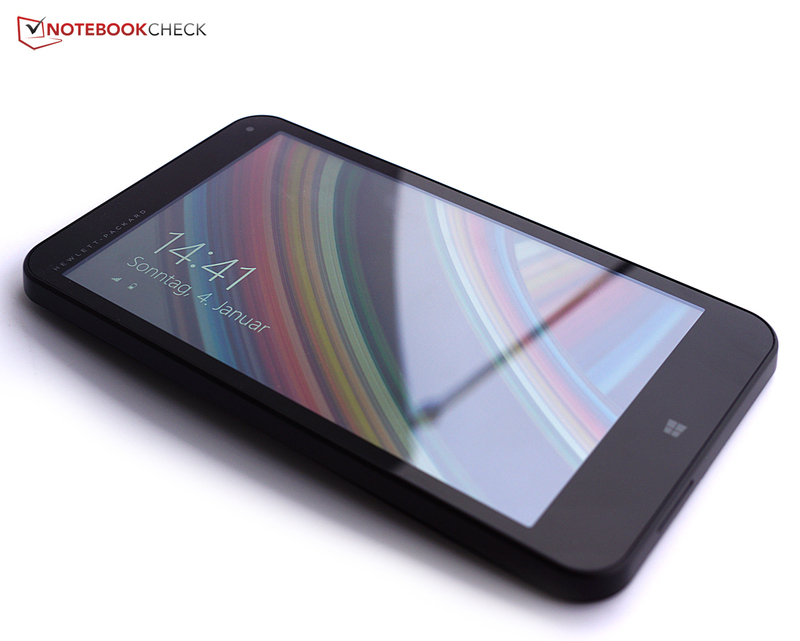 HP is in good company here, as both the Dell Venue 8 Pro and the Point of View Mobii WinTab utilize the same SoC. The other tablets in our comparison come with the Atom Z3740, which offers slightly better Turbo-performance and a memory controller capable of accessing more RAM. The Intel Atom Z3735G is fast enough to handle most of the daily tasks commonly encountered when working with Windows 8.1, although some lag and delays can be expected. Both the processor as well as the system performance are comparable to the Dell Venue 8 Pro; the tablets wit the Atom Z3740 are faster by about 10 %, although part of this increase in speed can be attributed to the larger amount of RAM. Because of the 32-bit OS on one hand and the low amount of RAM on the other, there are no guarantees that all applications will run smoothly - quite a few of our benchmarks, for example, refused to run at all. Web surfing is generally possible without problems, although elaborate flash animations or HMTL5 videos can introduce occasional stutters and lag. We observed this behavior with ad banners as well as high-resolution YouTube videos. 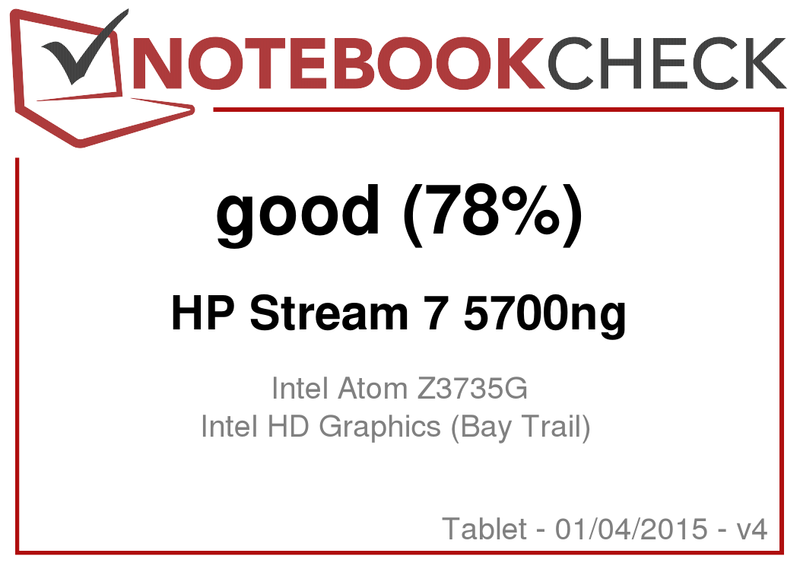 Graphics performance of the HP Stream trails the competing tablets with Atom-Z3740 SoC by roughly 20 %. The performance is not sufficient for the current crop of desktop games - we will take a closer look in the section on "Gaming Performance". The integrated HD Graphics (Bay Trail) is fast enough for normally encountered tasks and for video acceleration. The 32 GByte eMMC flash module is quite fast and the tool CrystalDiskMark attests the HP Stream 7 better performance in that area than the other tablets in the comparison. Especially the average write speed is superior. In addition to games available from the Windows App Store, "normal" Windows games can be installed as well. This only makes sense though if the game in question is practically ancient: we were able to play "World of Warcraft" at the lowest resolution - at least as long not too much was going on. A game like "Anno 2070", which is about three years old now, wasn't playable even at the lowest resolution and the lowest settings. In addition, Anno 2070 isn't much fun without a mouse and a keyboard. The SoC handled games from the Windows Store - for example "Jetpack Joyride" - without any issues, however. The SoC is passively cooled - the HP Stream 7 has no fan and thus remains completely inaudible during operation. The temperatures are well controlled as well: during idle, we recorded a modest 32 degrees C; under maximum load levels, the temperature increased to a maximum of 42 degrees C on the back. Although this increase is definitely noticeable, the HP Stream 7 remains cooler than the larger competitors - despite the fact that a larger chassis should allow for a better cooling solution. Overall, the observed temperatures are certainly quite low and very good for the class. The single speaker is located on the lower edge of the chassis. For a tablet this size the speaker quality is adequate and the maximum volume is sufficient. Mids and highs are a bit too forward, although we could still hear a decent amount of details. Of course, the dynamic range can't compare to a higher-end speaker system. Maybe HP could've included audio-software to enhance the sound quality further. The single speaker works well enough to listen to a song once in a while or for YouTube videos. To truly enjoy music or for watching movies we would recommend external speakers or headphones, which can be connected to the 3.5 mm audio jack. Does the smaller display really influence the power consumption that much? As far as the power requirements are concerned, the HP Stream 7 does exceedingly well when compared to the competition: we measured a maximum of 1.4 watts during idle - the Dell Vernue 8 Pro needs more than four times that. All other competing tablets required at least 2.3 watts. We measured a maximum power draw of 6.4 watts, which is once again way lower than the competition. One shortcoming: while other tablets don't draw any power when turned off, the HP Stream 7 still requires 0.1 watts. This means that the tablet will eventually run out of battery even when its turned off. We have to congratulate HP on a job well done as far as power management is concerned - and the run times on battery confirm it. We were able to browse the Internet for over 10 hours and could watch HD videos for about 9 hours. The other competitors don't even come close. The fact that the HP Stream 7 doesn't offer the longest battery life under full load doesn't really matter, since that scenario is not relevant on a daily basis. In review: HP Stream 7 5700ng, courtesy of HP Germany. In Review: HP Stream 7 5700ng. Test model courtesy of HP Germany. 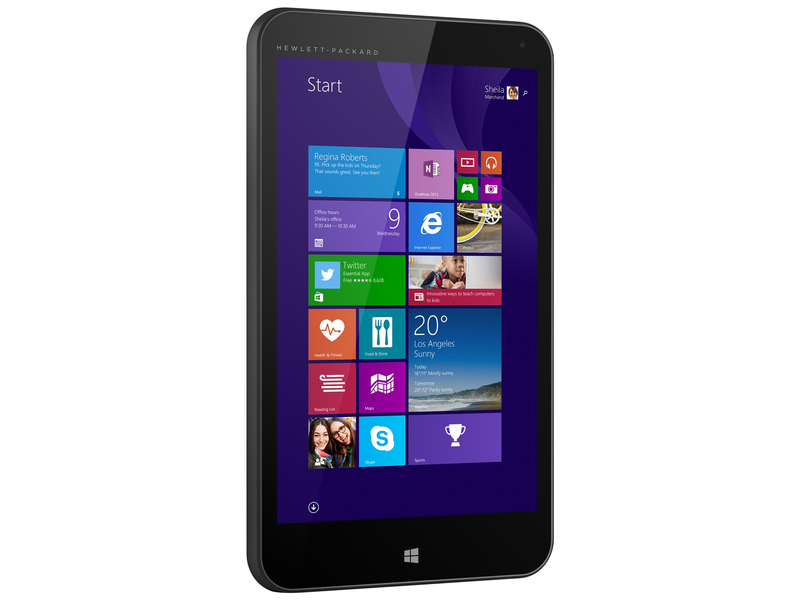 The HP Stream 7 is an affordable tablet with Windows 8.1. ...although the OS doesn't appear to be that well-suited for tablets. An example: data transfer via USB isn't possible. The cameras appear to be an afterthought and are not truly useful. The rear-facing camera is OK for occasional snapshots - as long as the expectations are kept in check. The back cover is removable, but the battery can't be swapped out. Only the micro-SD card slot is accessible. The SoC is from Intel and sees duty in other Windows tablets as well. The Stream 7 makes sense as a secondary device, for users with low demands, for those who need long battery life and Windows-fans in general. The idea of porting Windows 8.1 to smaller devices does have some appeal. In practice, there are some limitations: it's difficult to move the data from the PC to the tablet and some programs won't run at all because of insufficient RAM. How much HP was able to decrease the power requirements with the same SoC and a display that's only slightly smaller.